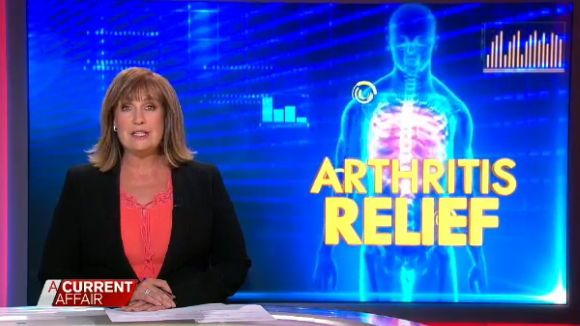 Arthritis Breakthrough – Is Theracurmin The Answer? A Current Affair featured one product in particular – Bioceuticals Theracurmin. Theracurmin BioActive 300mg is an advanced curcumin product featuring a patented manufacturing technique that increases the bioavailability of curcumin. This preparation reduces the particle size of curcumin and suspends it in a unique matrix, dramatically increasing its solubility and absorption. 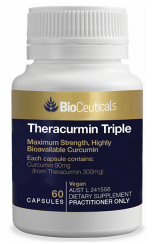 Bioceuticals Theracurmin Triple is a new triple strength formula, delivering 90mg active curcumin per capsule. For centuries, turmeric has been used to treat complaints such as gastrointestinal and liver disorders, poor digestion, anorexia, cough, diabetic complications, inflammatory conditions, traumatic injury with swelling and pain, rheumatism, sinusitis, menstrual problems, wounds, and skin diseases. Curcumin is the primary active ingredient in the well-loved eastern yellow spice turmeric. With almost 3000 preclinical investigations, curcumin is one of the most widely investigated botanical constituents in literature. It is a polyphenol antioxidant that makes up between 3-5% of the spice. No study to-date has found curcumin to be toxic to animals or humans at any dose. Most of the recognised benefits of curcumin have been attributed to its powerful anti-inflammatory and antioxidant properties. Inflammation and oxidative damage have been shown to play a major role in many chronic and degenerative illnesses, including neurological, cardiovascular, metabolic, pulmonary, autoimmune and neoplastic diseases. Studies have demonstrated that curcumin acts as a master switch of inflammation by acting at the level of pro-inflammatory enzymes and transcription factors, including nuclear factor- kappa beta (NF-kB), a critical mediator of inflammation. The pro-inflammatory cytokine TNF-alpha plays an important role in the regulation of immune cells and the development of systemic inflammation, and has been implicated in a variety of inflammatory diseases such as rheumatoid arthritis, Crohn’s disease, multiple sclerosis, psoriasis and cancer. Both in vitro and in vivo studies showed that curcumin has profound inhibitory effects on the production of TNF-alpha. Curcumin is reported to possess anti-inflammatory, antioxidative, anti-amloidogenic and metal chelating properties that may result in neuroprotective effects. Alzheimer’s disease (AD) involves amyloid-beta accumulation, oxidative damage and inflammation. Curcumin can cross the blood-brain-barrier and bind to amyloid and related aggregates, therefore reducing plaque and fibril formation associated with AD. Curcumin shows its ability to help treat a number of inflammatory bowel disorders and gastrointestinal diseases such as GIT cancers, irritable bowel syndrome (IBS), Crohn’s disease and ulcerative colitis. In a recent study, curcumin was given to inflammatory bowel disease patients with significant reduction in their symptoms. This was partly due to curcumin’s ability to act on the epithelial cell level of the colon where it prevented the cell wall destruction, as well as dampening the overactive immune response that is the cause of much of their discomfort and pain. A significant reduction in the spasmodic contractions of the colon was also noted, which is of huge benefit to not only these patients but potentially to IBS sufferers too. Curcumin, in its natural state, is highly lipophilic and its poor bioavailability after oral administration has been a major challenge. To overcome this, Theracurmin was formulated; a natural nanoparticle form of curcumin with hydrophilic tendencies; allowing easier access within a cell, therefore having far greater absorption and health impacts. 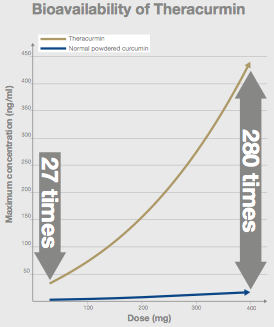 Utilising a patented manufacturing technique that reduces the particle size of curcumin and suspends it in a unique matrix, Theracurmin features a highly advanced delivery system that dramatically increases the solubility and systemic absorption of curcumin. The bioavailability of curcumin from Theracurmin ranges from 27-fold (at 30mg curcumin) through to 280-fold (400mg curcumin), in a dose dependent manner. Curcumin has scientifically proven massive potential in the medicinal world in a large array curcumin of biological areas. It effects virtually the entire inflammatory arena from Alzheimer’s disease to cancer and everything in between, including gut and joint health, diabetes, cardiovascular and liver disease, and obesity. It is effective and has no known toxicity level. 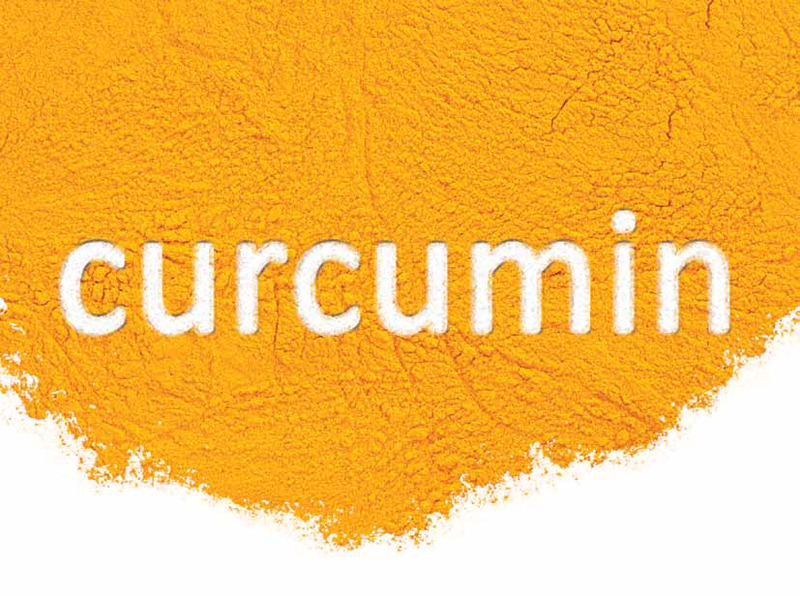 Now with excellent bioavailability, curcumin in the form of Theracurmin should be a key treatment for inflammatory conditions. To purchase and find out more about Theracurmin, click here. Caroline helped me a lot. Thank you very much! Does Tumeric from the spice rack have the same benefits as Phamacutical Tumeric?? ?